What Is An Isolated Power Supply and Which RLE Products Require One? If you’re looking at RLE leak detection, you’ll notice that certain RLE controllers and products state a requirement for an isolated power supply. Many users wonder about this requirement, and quite a few try to sidestep around it and then have issues with their systems. 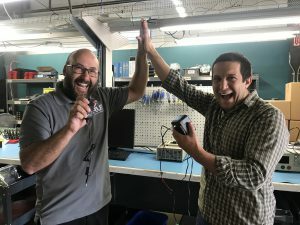 We sat down with Joe Schuetz and Ryan Clemens to get the inside details on isolated power supplies and learn why they’re a very important component of many of our leak detection systems. Why Does It Matter If You Use An Isolated Power Supply With Our Products? Many RLE controllers require the use of isolated power supplies. An “isolated power supply” essentially means the power the controller uses must be isolated from earth ground. The reason these controllers need an isolated supply is due to the way our systems use electrical current to detect leaks. If you use one of our controllers with a non-isolated power supply, you jeopardize the accuracy and effectiveness of the leak detection system. I Already Have Power Close By That I Planned To Use. Can’t I Just Use That? One of the most typical issues we see in the field occurs when a technician pulls AC or DC power directly off a panel or from a supply on equipment that is nearby. Typically, these supplies have transformers that have one leg attached to earth ground. When our sensing cable is then placed in a drain pan or touches other metal building materials it will create an earth ground loop and the controller will not be able to properly detect the electrical current on the cable. This could cause the system not to alarm when water is present or to alarm randomly without water present. By using an isolated supply we eliminate the chance for these issues to occur. We do have a few different styles of isolated power supplies that have been tested and approved for use with our products. We stock wall wart style isolated power supplies and can provide DIN rail mounted solutions too.